In the field of education, Dayanand Anglo-Vedic College Managing Committee, New Delhi, popularly known as DAVCMC, is one of the most trusted non-governmental organisations in India. Since the foundation of the first DAV School in 1885 at Lahore, the institutions under the administration of DAVCMC have created Nobel laureates, Prime Ministers, Scientists, Sports persons, Defense personnel, Actors, Media persons, CEOs and many more, making meaningful contributions to the economic and social development of India. Today, DAVCMC runs and manages over 840 educational institutions comprising of public schools, grants-in-aid schools, colleges, institutes of professional education and research institutions, employs 50,000+ people and educates more than 20 lakh students every year. One of the prominent institutions of higher education under the DAVCMC, New Delhi is DAV College of Education, Abohar, which was established in 1968. Celebrating its golden jubilee this year, DAV College of Education is located in Abohar, a beautiful city that lies close to the India-Pakistan border in the state of Punjab. "DAVCMC established this premier teaching-training institution with the pious vision to produce teachers of an impeccable sense of teaching ethics, sterling national character and emphatic social commitment," says Dr. Urmil Sethi, Principal, DAV College of Education. The College is permanently recognized by NCTE and affiliated to Panjab University Chandigarh under 2f and 12B clause of UGC. College is also recognized by NCERT for running ETT course. College is also recognized by the government of Punjab under the grant in aid scheme. For the placement of students, DAV College of Education has robust plans of collaborations with other teaching practice schools and colleges through guidance and counseling cell of the institute. DAV College of Education is one of the oldest colleges in Punjab, which is catering to the needs of the Abohar region by equipping each pupil with all the indispensable traits and necessary life skills to be an impressionistic teacher. Since its inception, the college has been rendering selfless contribution for the cause of society through modern education and Vedic values. Dr. Sethi opines, "It was the missionary consciousness of the dynamic and motivating leaders like Justice Mehar Chand Mahajan, Dr. G.L. Dutta, Darbari Lal, T.R. Tuli, G.P. Chopra and Shri Punam Suri (Present President of DAVCMC) that DAV continues to surge ahead and achieve sublime success." The vision of DAV College of Education telescopes well with the National Policy on Education - 1986, which laid great emphasis on developing a national system of education with education for all. To prepare the competent and committed teachers, the institute offers three programmes viz. Bachelor of Education (B.Ed. ), Master of Education (M.Ed. ), and Elementary Teacher Training (E.T.T./D.El.Ed.). "We are committed to equip each of our pupils with all the necessary skills to become an effectual and pro-active teacher," claims Dr. Sethi. A glorious chapter has been added in the fabulous history of the college when the institution got approval from UGC for establishing Maharishi Dayanand Saraswati Study Centre for the promotion of and dissemination of the ideals of this great sage. "Holistic education demands development of all aspects of an individual's personality across various domains. In the light of this statement, we can safely assume that the aspect of co curricular activities in a teacher education institute cannot be neglected," pinpoints Dr. Sethi. DAV College of Education has 100 percent result and students regularly get placed in the merit list of university in B.Ed. and M.Ed. examinations organized by Panjab University, Chandigarh. Besides this, the Institute had in the past organized approximately 58 National and International seminar and conferences, which aimed at developing intellectual aspect of the teachers and pupil teachers. The college has the distinction of having the maximum number of faculty members who have qualified UGC-NET, STET and CTET examinations. At present, the institute has eight members with PhD in education and others are currently pursuing the same. "Faculty members are always striving for higher professional development through supervising dissertation of M.Ed. students and publication of research papers in the reputed journals," explains Dr. Sethi. For the placement of students, DAV College of Education has robust plans of collaborations with other teaching practice schools and colleges through guidance and counseling cell of the institute. Dr. Sethi says, "Every effort is made to develop soft skills, analytical skills, group discussion skills and verbal and nonverbal skills to make the students more competent and confident." Microteaching is the regular feature of the college with two periods per week. Modern infrastructure and well-equipped laboratories in tune with the latest technology, smart classrooms, projectors, LMS (Learning Management System), computer lab, language lab and Wi-Fi enabled campus are some of the highlights of the institution. In addition to those, a fully computerized air-conditioned library facility is available for staff and students with INFLIBNET for accessing more than 60 thousands International and national journals. Three times overall trophy winner in the PU Zonal Youth and Heritage Festivals, the college has won Punjab University Athletics, Table Tennis and overall Women Volleyball Championship in 2017. Nisha won gold medal & silver medal in Punjab University Yoga and Inter University Yoga championship respectively. Nazia Kamboj won gold medal in Archery and selected for Inter University Archery Championship in 2017. College won overall Trophy in skill-in-teaching and on the spot preparation of teaching aid competition of Punjab University Chandigarh in 2017. The institute also distributes scholarship of approximately Rs. 5, 50,000 to needy and brilliant students every year. Today, from preparing a horde of competent and committed teachers to equipping would-be teacher with comprehensive philosophy of education, DAV College of Education has devised many goals to achieve in the upcoming years. "Our vision is to be one of the centers of excellence in teacher education based on Indian Vedic ethos coupled with modernity," concludes Dr. Sethi. 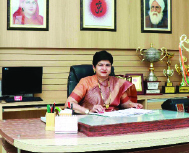 Dr. Sethi has 31 Years teaching experience of B.Ed. & M.Ed. Classes in DAV College of Education, Abohar with specialization in Philosophy, Yoga Education, Teaching Learning Process and Teaching of Sanskrit. She has guided more than 30 M.Ed. Dissertations and published a lot of research papers and articles in various national and international Journals. She has also authored nine books in the subject of Yoga Education, teaching of Sanskrit, Women Empowerment, Value Education, Philosophy of Education, Moral Judgment, Understanding the Self, Yogasanas and Pranayama. Under the dynamic leadership of Dr. Sethi, DAV College of Education is well on its way to accomplish future landmarks.